The Southwest Through Wide Brown Eyes: Open Your Eyes and See Nature's Surprises. One warning I always give to visitors of the Southeastern corner of Utah; make sure your head is on tight, or it will spin right off your neck. Traveling down Route 191 towards Moab,from Interstate 70, and continuing on, you will see sights that will make you truly believe you are on an alien planet. Look up movies that have been filmed in Moab, Utah alone and the list is long; probably longer for Monument Valley. Johnny Depp's newest film, "The Lone Ranger" was filmed there, as was an episode of the most popular British television show, "Doctor Who". As I mentioned, I've lived in Monticello for four years. We'd only just moved here when one day I heard these "screams" that many a person would assume was a woman, but I'd heard enough of these calls in zoos to identify it...a peacock. Yes, we have wild peacocks in our area, and it is not unusual to see one go strolling down the street. The males are bolder, and the smaller peahen is shy and tends to hide if spotted. I enjoy taking walks through the neighborhood hoping to spot one of these birds; hoping more to find their beautiful feathers. 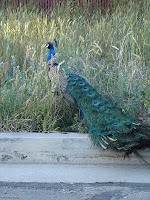 In Greek mythology, the peacock belongs to Hera, the queen of the Gods. Traveling South on Route 191, one of the big attractions is Wilson's Arch. However, did you know there was a "baby" arch just two miles down the road from it? At mile marker 98 is a parking area; looking East you will see the "baby" arch. I believe I first noticed it in 2011, but it could have been as early as 2010; I know for a fact that time does fly when having fun in this area of the Southwest. After taking photos of it, I sent copies to the Bureau of Land Management (BLM) to inform them of my finding; haven't heard anything yet. Wouldn't that be something if I had found an unknown arch and to have it named; what a legacy that would be!!! Update: An agent at the BLM - Monticello Field Office informed me that this is called "Lopez Arch"; so much for having an arch named after me. Keep on traveling South on Route 191 towards Monticello and eventually you'll see a large, domed shaped, sandstone formation with what looks like a temple on top. This is Church Rock and the story is that when the Mormons first came to this area of Utah, they used a small cave inside as their first meeting place for worship. Fortunately the gates to the fenced in land were open one day and visitors were allowed to travel up to the formation. Indeed there is a small cave like area, but unfortunately it has been ruined by so-called artists and their graffiti. The next day the gate was once again locked up, but it had been a thrill to have the one opportunity to step inside a natural piece of history. The story about the pioneers happens to be another legend, and that is all; no truth to it. Across from the Church Rock area is Route 211 which leads to Newspaper Rock and eventually to Canyonlands National Park (The Needles area). I had mentioned in a previous post that a jug handle arch was just 1.8 miles West of Newspaper Rock itself. This was another one of those if you don't pay attention the first time, the second time, even the third time, you're going to miss it. I don't know how many times we rode past this point and didn't notice it, but one day we stopped to look southward and beyond; there it was! It is not the typical arch that has been carved out of a sandstone wall by the wind and rain. It looks to be more of a separate rock piece that is attached to another wall at the top and bottom, but the elements have rounded and smoothed it out to that jug handle appearance. One of the advantages of riding as a passenger is getting to see things the driver cannot; gotta pay attention to the road you know. My poor husband knows he better stop that vehicle when I say "Stop!" though. This formation at the top of one of the sandstone mountains along Route 211 looks almost like a cottage with a chimney at the top; you could almost imagine a cloud floating by as the smoke emitting from it. I think one of the funniest natural surprises came when I was stretched out on some flat rocks, just enjoying the beautiful day and feeling like a lazy lizard. When there it was, a brightly colored, collared lizard had decided to join me on the rocks. Bravely, or stupidly in anyone else's eyes, I put out a finger to touch it. It flicked its tongue over my finger and then just stayed there; not moving to escape, just resting. Nice to know I had its approval to be there. Yeppers, make sure you travel through this area of the Southwest with wide open eyes; never know what you'll miss if you don't.